Known as the Jerusalem of the Aegean, Patmos is the island where St. John is said to have written the Holy Book of the Apocalypse. The island’s focal point is the impressive Monastery of St. John the Theologician which is visible from almost everywhere on the island and is included among the seven major pilgrimage sites of Europe. Its historic centre (Chora), the Monastery of St. John the Theologician and the cave of the Apocalypse, have been included by UNESCO in the World Heritage List and are part of mankind’s common heritage. Patmos is the northernmost island of the Dodecanese - itis situated between the islands of Leros and Ikaria, SW of Samos and it has a surface of 34 sq. kms and a coastline of 63 kms. Subject to Patmos are also the islands of Arki, Lipsi and Agathonissi east of Patmos. In addition to the spirituality and its reputation of being a shrine of Christianity, its natural beauty, picturesque settlements, the traditional architectural style of its capital “Chora”, its crystal clear waters and the well developed tourist infrastructure make it an ideal getaway for those seeking inspiration or a quiet retreat. The natural beauty of Patmos combined with the picturesque Chora and the unique religious atmosphere are some of the reasons why the Forbes Magazine has voted Patmos as the most idyllic place of Europe. The island is suitable for a quiet vacation; at the same time, however, if you are looking for a cosmpolitan atmosphere and night life this is also the place, as Patmos is a destination amongst the most loved ones of international jet set who love it for its calm and mystic atmosphere! According to mythology, Patmos was a gift from Zeus to his daughter Artemis, goddess of hunting and young women. She was worshiped on the island in antiquity, and the monastery of St. John was built on her temple.The first inhabitants were the Cares in 3000 BC followed by the Dorians and the Ionians. Much later, when the Romans ruled Patmos, the island became an exile place. Patmos acquired its current glamor from the time that the Evangelist John the Theologian was exiled from Ephesus in 95 AD. Isolated in the cave of the Apocalypse as it is known today, John writes the divinely inspired book of the Revelation or the Apocalypse. All traditions around the beloved disciple of Christ testify that Christianity prevailed early on the island. In 1100 AD the monk Christodoulos founded the Monastery of St. John the Theologician. In 1200 the island was conquered by the Venetians and in 1537 by the Turks. Since the founding of t he Monastery there follows a continuous economic bloom for the island. The harbor of Skala becomes the safest and main port in the whole area. Large storehouses, castles and rich mansions to protect against pirate attacks are built. In 1659 the Venetians destroy the island and in 1669 the island falls under Turkish occupation. The island of Patmos is finally freed in 1948 and united with the rest of Greece. The Simantiri mansion in Chora. Built in 1625 this two-storey building offers guided tours by its 8th generation owners. The Monastery of St. John the Theologian. Remarkable is the collection of the Library and the relics displayed in the Ecclesiastic Museum which functions inside. Open: Mon - Wed - Fri - Sat : 8:00 to 13:30 , Tues - Thurs - Sun : 8:00 to 13:30 & 16:00 to 18:00. The Cave of the Apocalypse, just before Chora, connected by a pathway (10-15’ walk) with the Monastery. This is the exact place where St. John wrote the Apocalypse when exciled in 95-97 A.D. The temple of St. Anne inside the Holy Cave is impressive. The famous Patmian School established in 1713 and which currently operates as a ecclesiastic Faculty. The nunnery of the Annunciation wherein operates a handicrafts school of Patmian embroidery. The nunnery of “Zoodoxos Pigi” within the town of Chora with icons dating back to the 16th and 18th centuries. The remains of the Immaculate Baptistery of St. John the Theologian (AD 95) in Skala. The old restored windmills which dominate the town of Chora and enjoy unobstructed visions of the port. On the hill of Kastelli are the ruins of the citadel of the ancient capital of the island. You can still see the fortification wall and the foundations of an ancient temple dedicated to Apollo also see near the church of Saint Constantine. The religious music festival which is held in Patmos the first two weeks of September. It is held in the outdoor area of the holy cave of the Apocalypse. The ceremony of the Basin (the washing of the feet), on the morning of Holy Thursday in Town Hall Square, which is the representation of the Last Supper: The Abbot, washes the feet of twelve monks sitting around a large platform, just like Jesus with his disciples, and then as he moves towards the place of prayer, he reminds all believers of the transition of Jesus in the Garden of Gethsemane, where he was delivered by Judas to the Roman soldiers. Going up the little church of Aghia Paraskevi in Skala from where you will enjoy panoramic views of the floodlit harbor and Chora. Proclaimed as a UNESCO World Heritage site (along with the Monastery of St. John the Theologian and the Cave of the Apocalypse) Chora is the capital of Patmos and one of the most impressive Choras (capitals) of the Aegean. Chora, capital of the island, is a medieval village, a small community in itself, with lots of charming little restaurants and bars, some exquisite shops and small grocery shops. It is built around the medieval Monastery – castle of St. John. The village is connected with the rest of the island through regular bus transport and taxis or the old and historical path that was built in 1819, which takes visitors down to the port in approximately 20 minutes. Going down to Skala, halfway between, we find the Cave of the Apocalypse. In silence we face the fissure in the ceiling from where the Word of God was revealed to St. John as a vision. Skala is the port of Patmos and the biggest settlement of the island. A charming little port with lots of authentic restaurants, Greek cafes and shops of all kinds. Evening entertainment is offered through a variety of bars, clubs and open coffee shops. 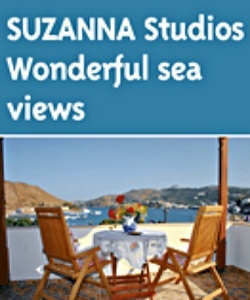 All accommodations are mainly located at the quiet back part of Skala or along the sea front. Regular bus transport & taxis connects Skala with all parts of the island and daily excursion boats offer day trips to various quiet beaches and other nearby islands. In Skala there are buildings influenced by Italian architecture that were built during the during the occupation; your attention will be drawn by the Italian headquarters that now houses public services. Visit the Baptistery of St. John, where according to tradition the saint baptized the Patmians. Skala port has a marina for the berthing of vessels and yachts. Overlooking the mysterious “Kalikatsou” rock (on which lived hermits, carving stairs, ducts and positions visible to date), the visitor will enjoy swimming in this hospitable bay. Right across is the small islet of Tragonisi (goat island!) that you may reach by swimming!Grikou has a small a marina for recreational boats, luxury hotels, a beautiful beach, shops on the beach and very close to to the beautiful area of Petra.The attraction of the region is the lake; it is a wetland is of exceptional beauty, the winter home to herons, swans and wild ducks.Grikos is connected with all parts of the island through regular bus transport & taxis or old paths leading to Chora and Skala. A rural village approximately 5.5 Km from Skala located in a beautiful sandbay with lovely white houses in the Aegean style. An unspoiled piece of nature where fishers and farmers are your next door neighbours. The village square as well as the beach offer a variety of good taverns and a small grocery shop supplies you with whatever is needed. Shady trees and sun-beds on the beach give the visitor any comfort required and water-sports facilities are available for those who need some physical activity. Kambos is connected with Skala through regular bus transport & taxis throughout the day. Kambos is a hub for the northern beaches. Patmos has about 20 lovely beaches. Discover small bays and find you private paradise. Pslili Ammos is frequented by nudists but the beach is not reserved exclusively for them. Kambos : Sand & fine pebble. Sea sports, sea umbrellas, sunbeds and a beach bar (George’s place). Tamarisk trees for natural shade. Petra’s bay (also known as Kalikatsou): one of the most famous of Patmos with its impressive rock. Clear waters, large pebbles. Few sunbeds, beach bar and water sports available. Petra is a natural beach of coarse rocks starting from Petra and continuing towards the south of the island. There, begins a popular nudist beach, Plaki, with pebbles and small stones and a tamarisk tree. Agriolivado : Large sandy beach with fine pebble, 1,5 kms from Skala. Crystal clear and very shallow waters - ideal for families. Tavern, beach bar, water sports. Groikos : Welcoming atmosphere, crystal clear waters and many shops to enjoy by the sea drinking, food or coffee. The bay of Groikos, 4.5 km south of Skala, ranked among the best in the world. Overlooking the imposing Petra rock, you will enjoy diving on a picturesque cove with clear green waters. What steals the show, however, are the countless moored sailboats. The area hosts the the only 5 * hotel on the island, taverns and rooms. Aspri : Small secluded bay close to Skala, just before Meloi beach. Large tamarisk trees offer shade. Meloi : Just a 15’ walk from the port of Skala, so it is very popular to those who do not have transportation. Fine pebble – ideal for families. Right behind the beach is the unique organized camping of the island. Lambi : The sign "no collection of pebbles from the beach 'welcomes you to the Lambi beach, 7 km from Skala. The deep red that characterizes it, sets it apart from the other beaches of the island. Tamarisk trees, restaurant, cafe. Vagia : It is said that it is the coldest on the island but the quieter than the easilly accessible beaches of Patmos! Pebbles and shade from tamarisk trees. The beach is not organized but further up there is a cafe. Livadi Geranou : For endless dives away out of sight! Pebbly and not organized beach. There is a tavern. Liginos beach : They are two and they are ... twins! So at least the locals call it, because of the identical shape. Known as Linginou beaches, located in the northern part of the island famous for its clear waters and tranquility. Livadi Kalogiron : Small secluded pebble beach. You will find it by following the left junction in the village of Kambos. Psili Ammos : By many the best beach. It is a sandy beach 20-30’ walk or 40-60’ by excursion boat from Skala port. The beach is unofficially divided into two; away from the tavern is the part of nudists - although nudism is forbidden on this sacred island, it is common practice on some of its beaches. Patmos has no airport. From Patmos it is easy to visit Leros and the nearby small islands of Fourni and Lipsi. Patmos is a port of entry and exit. Port, customs and sanitary authorities are here, as is a yacht refuelling station (at Scala). By air: You can fly to one of the nearby islands of Samos, Leros or Kos http://www.olympicair.com, www.aegeanair.com and from there catch a local shipping agency that serves the islands. By sea: Blue Star Ferries (duration of trip appx. 10 hrs from Pireaus port). Patmos is a small island and has a good network of local transportation. Buses depart from Skala to Hora, Groikos and Kampos, and pass through many villages / beaches in-between. 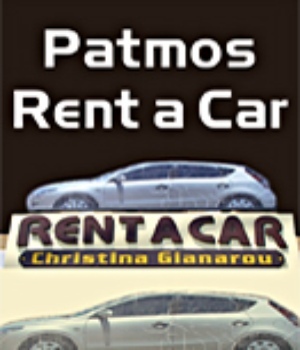 Patmos is ideal for renting a car or a motorbike. Please note that local authorities are very strict concerning the use of helmets while riding a motorbike. You may also use the Boat Owners Association to organize your own boat trip to little islands around Patmos, or enjoy the boat trip around the island. In Patmos island there is an excellent new Marina in the bay of Skala where you can moor your boat. It is located on the right side of the bay opposite the port. There are convenient moorings in various bays around the island, but the new Marina in the bay of Skala is the best place for your boat. You can order water and fuel in the Marina, Skala the major town in Patmos, has 3 Banks, boating equipment and supplies, while next to the Marina there are professionals for any kind of repairs on your boat. There is also a small dock in Grikos village that can also provide mooring for some vessels. Patmos has a marine center for hauling up, docking, parking, construction and complete boat service. You can also rent a boat and there is a diving center shop. Skala : the commercial port of the island. During July and August the marina is full. Religious Music Festival of Patmos - established as one of the major cultural events related to religious it gathers various artists from the international and Greek music scene as well as world-famous choirs. The festival is held under the Cave of the Apocalypse, the symbol of Christianity. International Film Festival - scheduled every July on Patmos island film-makers, actors, directors and film-critics from every part of the world gather here to attend one of the most important cultural summer events in Greece. August 15th On the day of the Dormition of the Virgin, on August 15th, Patmos celebrates with a big feast at the Monastery of Panagia Geranou with traditional dancing, singing and food. A series of events are organized on the island of Patmos, mainly in Skala, Kambos and in Chora. The feast of Saint John the Theologian is honored with glorious celebrations in Chora, on May 8th and September 26th. On 24th of September, locals celebrate the feast of Agia Thekla. The church dedicated to her lies on top of a small islet, right across Agriolivadi. Locals arrive there from the early morning hours to enjoy the ceremony and the feast that follows. The island of Patmos is quite windy so it’s ideal for windsurfing. Daily trips are being organized to the nearby islands of Lipsi, Marthi, Arki and Tiganaki. Not to be missed! The landscape invites you to take long walks and there is much to discover. There are many marked trails for walking. From Patmos you will definitely catch a daily tourist boat that goes to the neighboring islets of Arki, Tiganakia, Marathi and you can combine your holiday in Patmos with a stay in one of the neighboring islands of Lipsi, Leros or Samos.